I’ve been playing with Filetable and I was asked an interesting question. Can I move files to a folder programmatically? However suppose I loaded a bunch of documents into the Filetable folder and I needed to move or process them. I certainly could handle this easily from the client, but it’s actually simpler to do this from T-SQL. Let’s say I have a few files in the root of my Filetable as shown in this image. My Filetable is the Explorer table inside this path. If I check this from T-SQL, I see four rows I my table. Two jpgs and two pngs. The jpgs are books and I want to move them into a separate folder. 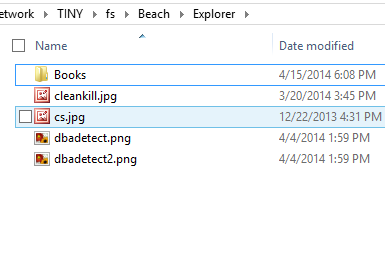 What I want is to now set the parent_path_locator of the jpgs to be that of the Books folder. However I can’t update that field as it’s a computed column. However I can update the path_locator of the two rows and compute a new HierarchyID value that includes the path_locator of the Books folder. The way to do this is similar to how I would add a file to a folder. I use this code to computer the new HierarchyID and update the existing rows. 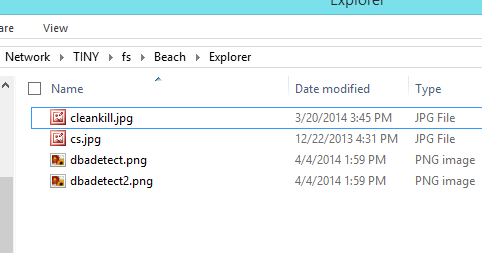 Here’s the root of the share, and you can see my file has been moved. I repeat this for the other file, though I could potentially have wrapped this all up into one statement. This easily moves my files to the subdirectory in my Filetable.